NAIROBI (Thomson Reuters Foundation) - More than a dozen senior commanders and officials who children say recruited them as soldiers in South Sudan should be investigated, Human Rights Watch (HRW) said on Tuesday. The United Nations says 16,000 children have joined armed groups since South Sudan's civil war erupted two years ago. "It's the brutal recruitment that is the most heart wrenching," Skye Wheeler, the report's author, told the Thomson Reuters Foundation. "Forces come through their village and grab them and force them into fighting. It's an absolute negation of their basic rights as children, but also as people, not to be treated just as cannon fodder." South Sudan was plunged into a civil war in December 2013 when a political crisis triggered fighting between forces loyal to President Salva Kiir and rebels allied with his former deputy Riek Machar. The conflict has reopened ethnic faultlines that pit Kiir's Dinka people against Machar's ethnic Nuer people. A peace deal was signed in August but the two sides have repeatedly accused each other of violations. A third of 74 boys interviewed who fought in the current conflict said they were forcibly recruited, often at gunpoint. Many said they were detained until they agreed to fight or simply abducted, handed a gun and sent into battle. "I had no experience of holding a gun before," said one boy in the report who was abducted from school by opposition forces. "They told us this is how you use it... Then we began fighting." Around half of the boys interviewed said they willingly joined armed groups to protect themselves and their communities. "Without the protection of a gun and an armed group, many boys believed they would have been even more vulnerable to being killed," the report said. Half of the child soldiers interviewed fought or worked for government forces or their allies. Among the most prominent names cited in the report is Matthew "Pul" Puljang, an ethnic Bul Nuer commander who fought in a Unity State militia before joining the government in April 2013. 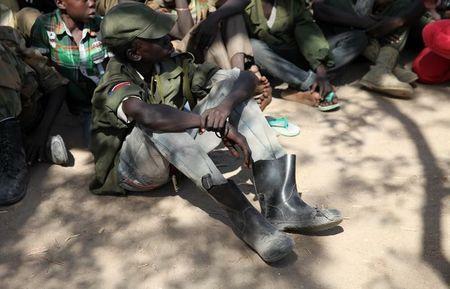 South Sudan's army spokesman Philip Aguer said its Child Protection Unit had planned to visit Unity State in 2013 to investigate allegations of Puljang using child soldiers. "But the visit was interrupted by the violence and it has never taken place," he said. "We welcome all investigations to prove any allegations." HRW also called for another former rebel who has joined the government side, David Yau Yau, to be investigated. Yau Yau has released 1,755 child soldiers from his ranks since he signed a peace deal with the government in 2014. "It not going to be solved just by releasing boys," Wheeler said. "There also needs to be accountability for commanders who have recruited and used child soldiers to end this endless cycle."